Whenever there is a project to be undertaken by a group that needs support for its completion, its content will be shown comprehensively using project description template where investors can fully understand its context and purpose. Incorporating a description template will be valuable in any project proposal where you can see the background, objectives, materials, resources etc. needed for the said project. It will make any involved person be in touch with the significance of the project and how they can participate in its completion. You may also see Office Manager Job Description Templates. Meeting the demands of a client is the key to a project’s success, that’s why project product description template will list the depiction and recommendations for a new product to stick in essential qualities required by any client. You may also see Social Worker Job Description Templates. 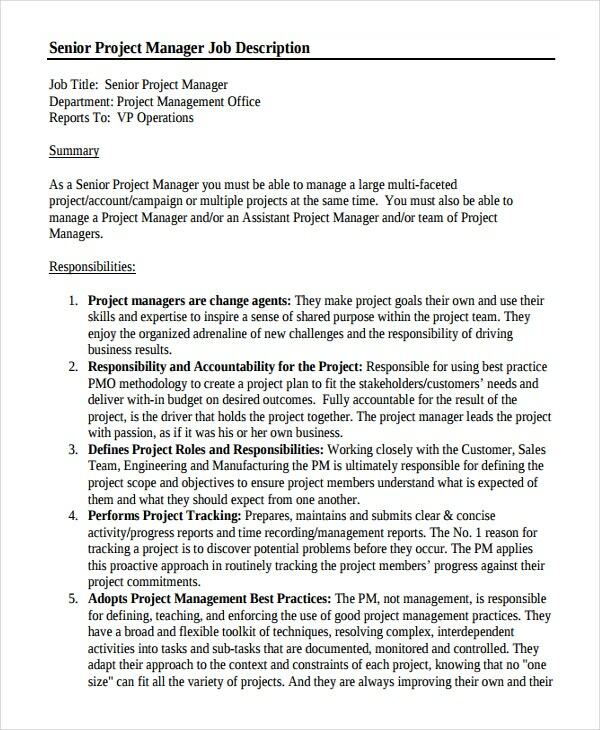 For a more concise resume for a project manager, you must choose a senior project manager job description where the roles and responsibilities of the position can be identified. With the detailed task that is entailed for being a project manager, it will surely help any employer to identify the skills needed for the job. 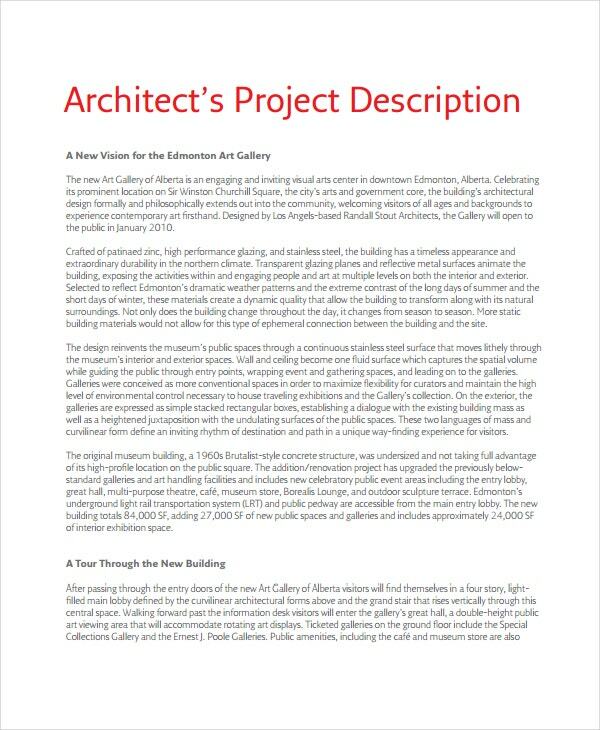 For an architect that wants to explain each content of the project they are working on, they can download architecture project description template where each part of the proposed plan will be explained. The materials that will be used and internal designs will be included in this template for the clients to read through for the approval of the project. Whenever there is a project to be done, you must have a proposal to its components and features so that the personnel involved in it will be aware of how the project will be done. 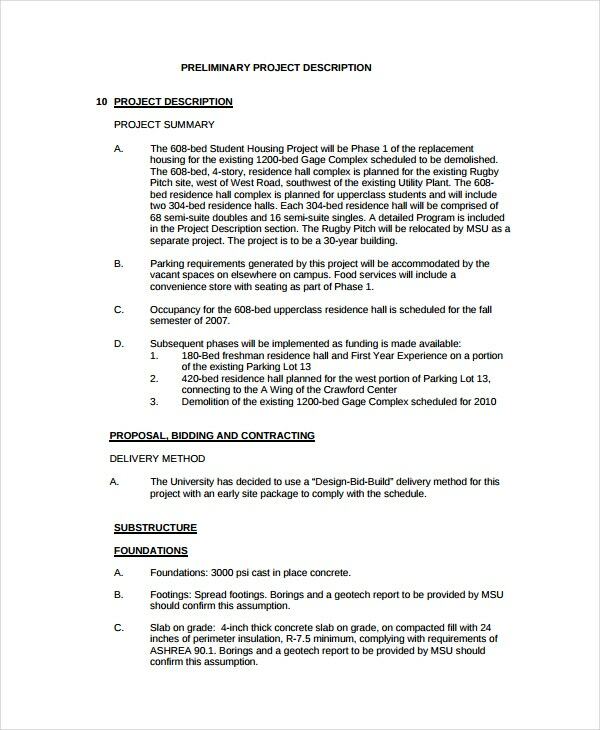 A Preliminary project description template is the tool you need whenever you need a formal document to support your project approval. 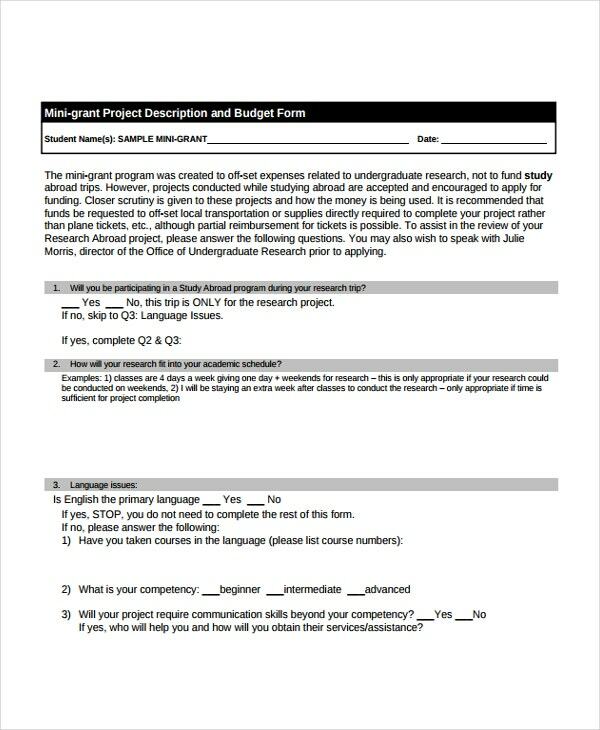 Research or projects involve appropriate funding to make the proposal be put in certainty; with mini-grant project description template, researchers can show the short explanation of the project and the materials that will be used. They are itemized for the backing of the sponsors. It will entail what benefits it will bring to the project team as well as for the sponsor themselves. 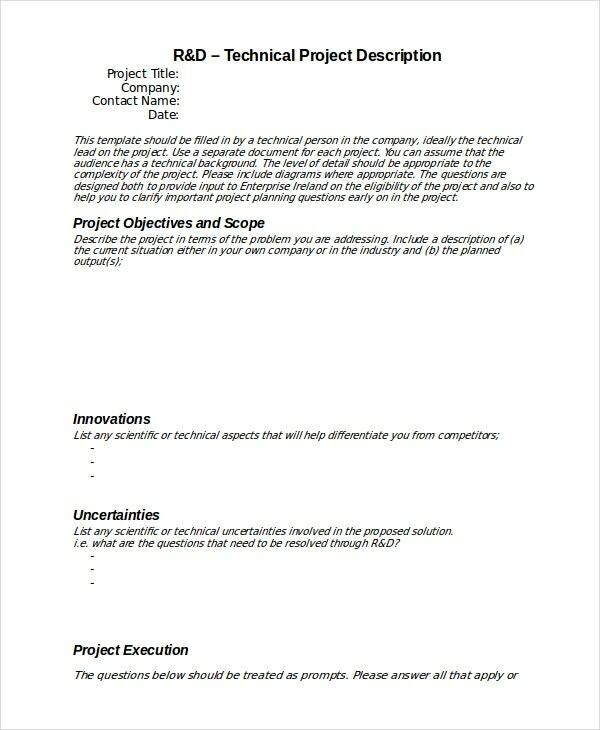 > What can I Get in Project Description Template? For those that are not aware, here are some of the benefits of project description template. 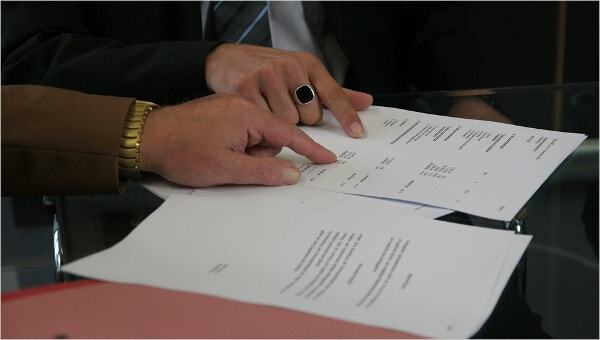 The team leader can have the formal document that he can show to any investors. It can tell the main key points of the project like its main goals and its return on investments in the long run. The template will explain part by part and in full details all the components of the project which is vital to see any problems that may be encountered in the completion of it. > Why Choose Project Description Template? 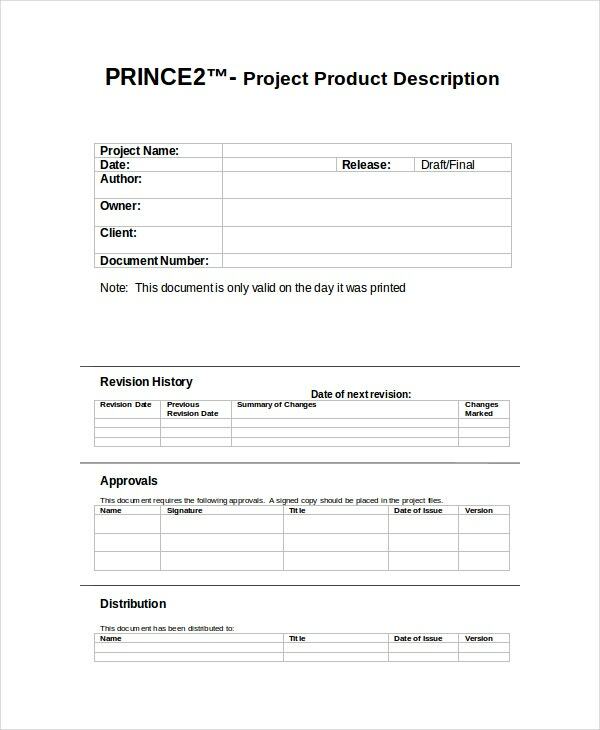 There is always a new product and plan that emerges once in a while, what better way to explain it than by using project description template? This is designed to make sure that it will express the main contents of the project for all the people involved in it, where it will convince them to join in the development of the project and the role they will serve in its completion. It is a blueprint document intended for outlining the main features of the project and how it will be done in the manner that the project leader wants it to be. You may also see Program Manager Job Description Templates. Have the team leader and its members involved in the creation of the template so that all the ideas will be consolidated into one document. Check the word description and labeling of each part to make sure that the idea of the whole project is delivered in a concise manner. Put only credible details and never put anything that will not be included in the actual construction of the project to prevent any claims or problems in the part of the sponsors. Your project plan will be as effective as the project description you will have for your sponsors to examine upon, so you need to take this template in your work for the approval you need for your proposed ventures. Go to template.net for this template to be yours for good.